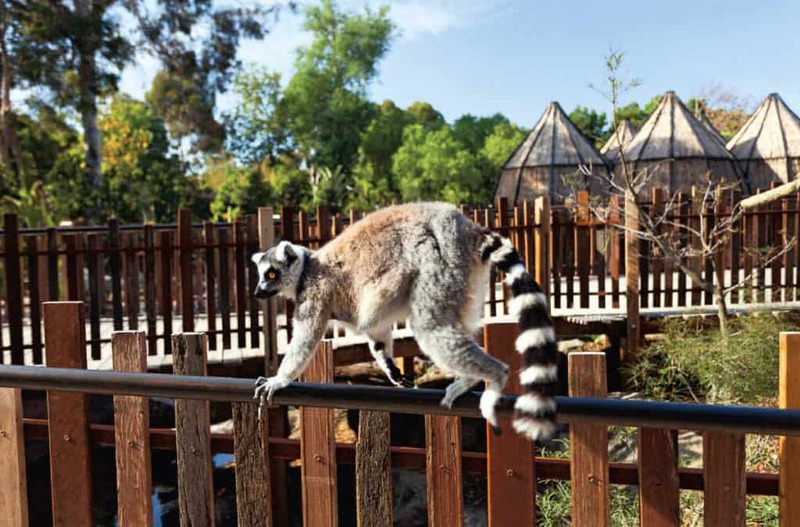 Our second article by Wendy Golden describes an epic fibre construction for the new lemur enclosure at Melbourne Zoo. The needs of these primates from Madagascar are met by one of the largest basket projects in Australia. During mid-2013 Basketmakers of Victoria (BOV) learnt a new enclosure for lemurs was to be built at the Zoo. I was fortunate to be with several other BOV members who met with Snowden Architects and staff from Zoos Victoria and were shown the concept plans for the exhibit. I was excited by the beautiful drawings and the ambitious scope of the project. The first words of the proposal “we are drawn to an organic tunnel-like structure that beckons us to enter” sounded so inviting. Woven structures were everywhere. The 11-metre long entrance tunnel, a series of large pods for the public to use, smaller pods for the animals and even smaller pods for food needed to be made. My mind was churning through the possibilities and problems of such a huge project. It was unclear if we were simply being asked for advice or being sounded out as possible makers for the weaving. 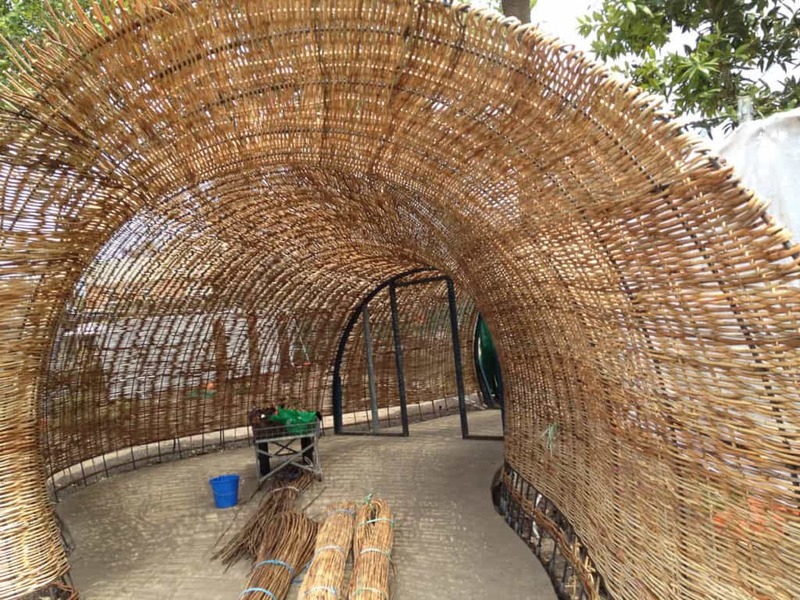 We discussed materials – willow or rattan and methods of weaving. Leaving the meeting I was exhilarated but felt some trepidation as to whom they would find to construct the weaving. Time passed and as BOV heard no more about the project, life resumed as normal. In July, almost two months after the first approach, Basketmakers of Victoria were asked to quote on six pods for the lemurs to use as shelter and five small pods from which they’d feed. The deadline to provide a written quote covering materials and the weaving time for the eleven structures was only five days away. Weaving needed to be completed towards the end of November. I went away (as did the other BOV members) and gave the project some thought. While this appeared to be a great project to be involved with, I had some concerns. First of all, there was the brief time to compile a quote, then a lack of concrete information about how and where the weaving was to be achieved. Just estimating and acquiring the quantity of rattan would be difficult, particularly as there was still some doubt as to what techniques would be employed. Clearly, physically the task would be a real challenge and need a number of people to work constantly to complete. I was uncomfortable with the thought of sending in a guesstimate so I declined the invitation to quote as did other BOV members and I expected to hear no more about the project. During August I was contacted by Karen Rawady from the Horticulture Department at Melbourne Zoo to give her a private lesson in random weave. I learnt the zoo had ordered a large quantity of pahang in different widths and Karen would be coordinating the building of the entrance tunnel with the bulk of the weaving to be done by the zoo’s volunteers. I then agreed to be employed as a weaving consultant on the project. The architect’s vision for the huge pods for the public to walk through and which would be a focal point in the exhibit was for rough organic weaving and for the weaving to run vertically rather than horizontally. This was quite a challenge and I was pleased to learn workers had been found who despite having no weaving experience were going to undertake this part of the project. The metal framework for all the weaving was well under construction. The tunnel was to be woven in a simple rand (in front and behind each stake) but would have to be woven through the metal framework. It would be an achievable but difficult task. To give the structure more movement different widths of Pahang would be used in the weave. Work began in earnest on the second of October with members of the zoo’s youth volunteer programme beginning the tunnel weaving. Experienced weavers will not be surprised to learn it was a slow process as each length of rattan was about six metres long and difficult to manipulate through the steel uprights. The weavers were too strong to crimp and turn so a heat gun was necessary to bend each strand. During construction, there was the usual gamut of Melbourne weather, rain, hail, freezing mornings and days in the high 30’s. So mud, sweat and tears were shed as work continued with the only exception being when rain stopped the use of electricity to power the heat guns. Some volunteers found the work too difficult and spent only short periods of time on the tunnel while others thoroughly enjoyed the challenge and worked for extra shifts. Zoo staff members were all encouraged to participate and it was great to see the architects, Zoo Director and Zoos Victoria CEO experience the challenges of the weaving. A young architecture student assisted as the project progressed. He was absolutely invaluable as he was tall, capable and able to reach the highest levels with ease. By late November the site was a hive of activity as deadlines loomed, machines beeped endlessly as they reversed and chugged past. Plumbers, electricians, landscapers, carpenters all frantically pulling together to get their tasks completed. It was a great experience for me to be on such a large building site. 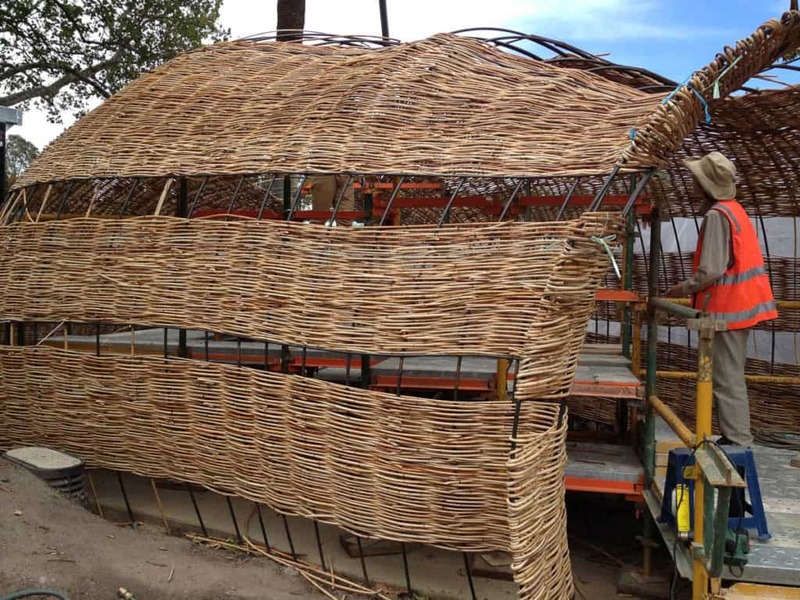 At the same time as the tunnel was being worked on, the huge people pods were being woven off-site by the brave inexperienced weavers, James Cattell, his partner Dorelle and their team. The day a huge crane came onto the site and lifted the people pods into place I was eager to finally see the work achieved. The pods looked very impressive from my viewpoint at the entrance tunnel. Just when we thought the weaving was complete we learnt two more structures were to have woven elements. A small exit tunnel and another shelter had to be woven. Dorelle worked on these for a time and then our team moved in to complete the weaving. Meanwhile, BOV members Maree Brown, Edit Meaklim and I constructed four feeder pods for the lemurs. These pods are suspended from fibreglass and metal trees. The trees have mechanism concealed inside enabling food to be placed inside the pods at ground level before they’re wound to the top of the trees. Throughout the project, Karen Rawady coped with an enormous workload. Making certain the material was damped down and in good condition, liaising with the coordinator of the volunteers and weaving a huge proportion of the tunnel. I was fortunate to still be working and on site when the lemurs were introduced to their new home. Staff and workers alike stopped and watched as the lemurs explored every corner of their large new space. It was a wonderful day for everyone who had worked on the project. I absolutely love the exhibit. From the moment you emerge from the entrance tunnel and are enveloped in a fine mist you cross a bridge and can observe the lemurs high up in the trees helping themselves to food from the small pods or wandering around at your feet. The planting is very sculptural and assists with creating the wonderful environment. It was hard manual work, challenging, frustrating and rewarding. I am pleased I had the opportunity and experience of working on what is clearly the largest woven project in Victoria, possibly Australia. This article by Wendy Golden was originally published in TAFTA magazine. You can find more images of the enclosure here. 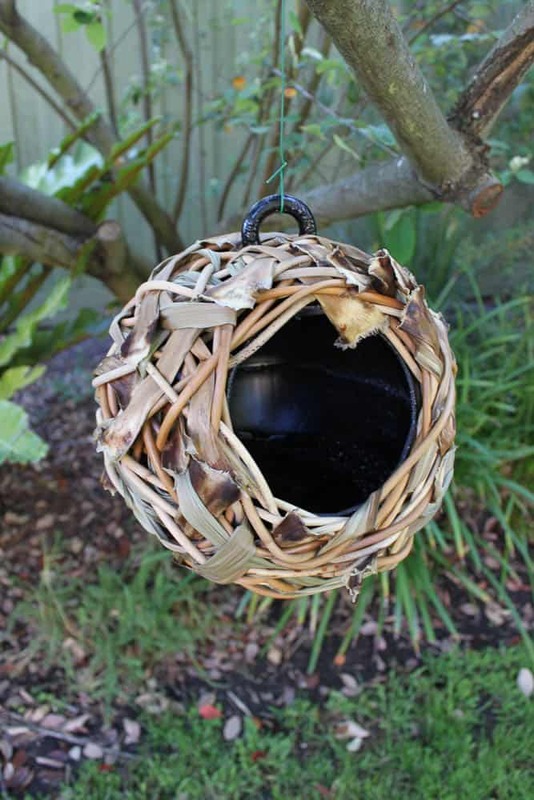 See also her previous article about baskets for spider monkeys.